Access to Mt Lawson is generally very easy and does not require a 4WD vehicle. The easiest way to get in there is to turn off the Murray Valley Highway into the Mount Lawson State Park at the sign for the Historic Trestle Bridge and then follow the State Park signs for Mt Lawson Summit. The trestle bridge was constructed well over 100 years ago to carry the now defunct Wodonga to Corryong railway line, sections of which have been re-purposed as a cycle trail. If you’re interested in railways or local history it’s worth taking the short stroll down the trail to check it out. 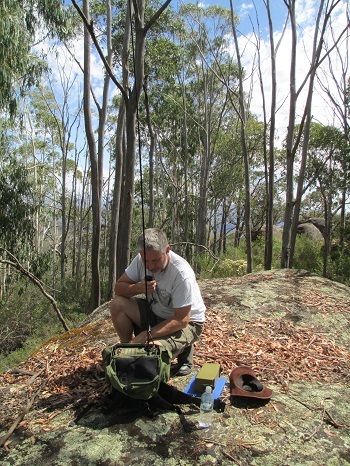 I had visited Mt Lawson several times previously and thought it would make an excellent venue for my first SOTA activation, and so my lady and I loaded up my trusty Hilux ute with the Barrett 940 and a picnic lunch and headed up there. We got to within 200m of the summit car park only to find a tree branch down across the road. Being public-spirited types, we got out the bow saw and cut it up so that we could drag it off the road. It was hard work and cost us twenty minutes, but at least the road would be clear for anyone else and, of course, for us on the way back down. On arrival at the summit car park I shouldered the Barrett 940, trying not to groan under its weight. This thing is definitely not suitable for hiking any distance, but that wasn’t going to be a problem on the short climb up to the summit. It’s fairly steep and the final clamber over the boulders at the top calls for reasonable agility, though it’s not strictly necessary as the whole of the top of the hill is within the Activation Zone. There’s a commercial repeater installation up there but that didn’t seem to be producing any electronic noise, at least not on the 7MHz band. Selecting a comfortable-looking boulder to act as the “shack”, I chucked the Barrett’s 10m wire antenna over a tree branch, laid a similar wire along the ground to act as a counterpoise, and we were off. There were stations audible the moment I turned the radio on, and within a short time I contacted VK3MRG/P, VK3HRA/P, VK5CZ, VK3BYD and VK1NAM/P. By the time I had finished making these few contacts the Barrett was beginning to complain about “Low Battery Voltage”, so it was time to pack up. I was using two 9AH SLABs in parallel and had fully charged them both before heading out, so was surprised that they had gone down so quickly. Later, when I got hold of the Barrett technical manual, I discovered that this radio does not like battery voltages below about 12.4V. The trip back down proved uneventful, with no further fallen trees to bar the way. When F0F2 is right, you don’t need much power to work NVIS within a radius of a few hundred kilometres. Barrett 940s don’t like low voltage. Use a 4S LiPo or LiFePO. Regardless of how well maintained Park trails are, trees fall or drop branches all the time. Take a chainsaw.